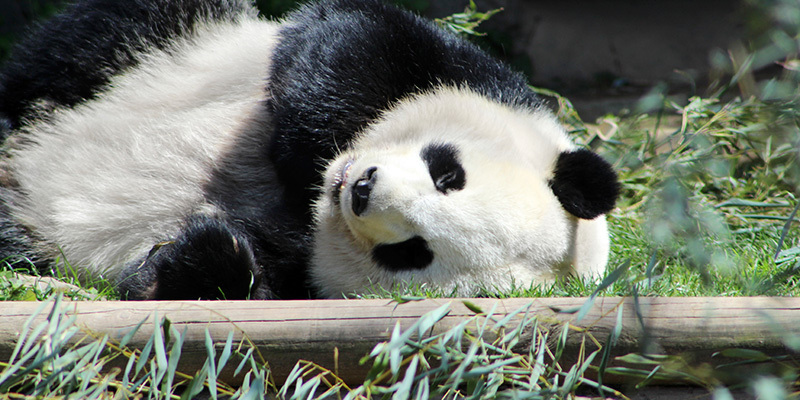 There’s a lot of false claims on the internet about bamboo pillows. Misleading claims and shady marketing techniques indicate that bamboo pillows are eco-friendly and a cure-all solution to a good night’s sleep—neither of which are entirely true. Don’t get us wrong—bamboo is a valuable resource. Bamboo grows incredibly fast, so it’s certainly a sustainable material to use. We’ve discussed the power of bamboo toothbrushes on our blog because the bamboo is in its original form instead of being heavily processed and mixed with things like sawdust (yes, some bamboo pillows include this not so cozy secret ingredient). This doesn’t mean all bamboo pillows are terrible, horrible, no good, very bad pillows. Some are probably quite comfortable, depending on what they’re filled with. 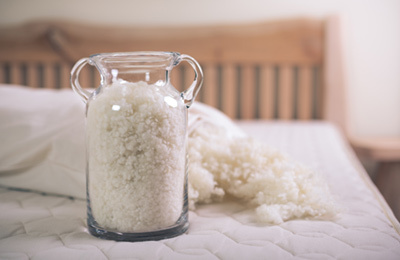 But in reality, bamboo pillows are not the green, environmentally-friendly products they are billed to be, which is why we offer fills like organic kapok and natural wool. Still think bamboo pillows are the best option? Maybe this list will change your mind. Bamboo pillows contain minimal bamboo. Most primarily contain memory foam, a toxic material that is known for retaining your body heat, leading to a hot and uncomfortable sleep. The pillow core is encased in viscose-rayon. This is a bamboo-derived material but that doesn't mean that it's natural or organic. The process of turning bamboo into viscose rayon involves a lot of chemicals. Rayon does not equal bamboo. 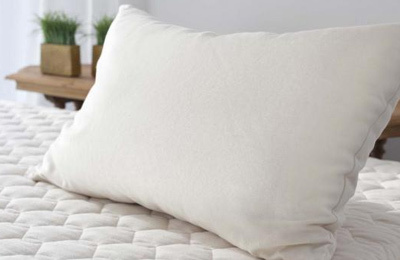 The rayon used in this fabric is so far removed from bamboo that the FTC ordered companies such as Walmart and Target to stop labeling pillows with rayon as "bamboo pillows." Here come the chemicals. The most common process used to make rayon from bamboo—the viscose process—requires spinning bamboo fiber in carbon disulfide, a highly toxic chemical linked to cancer and numerous developmental effects. The processes necessary to produce rayon are not environmentally friendly. In most factories, the recovery of carbon disulfide is 50%. That means the other 50% is going elsewhere. Rayon fibers rest in large quantities at the bottom of our oceans. Plymouth University completed a study on microplastics in deep-sea sediment and found that rayon—a non-plastic polymer—contributed to 57% of the fibers found. How many fibers are in the ocean? In the Indian Ocean, certain areas contain about 4 billion per kilometer. “Hypoallergenic” is just a label. According to WebMD, “There aren’t any standards for manufacturers on the use of ‘hypoallergenic’ to describe their products.” This means that a company can label a product hypoallergenic without any testing for allergic reactions. There isn’t a product on the planet that will always cure back and neck pain. But certain pillow manufacturers want you to think that. Some bamboo pillows may reduce back or neck pain but keep in mind, what works for one individual may not work for another. That's why we typically recommend customizable pillows because there is so much more room for adjustment and comfort. 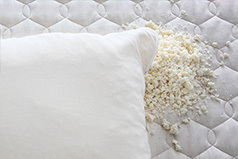 A healthful pillow should not contain materials that are made using toxic chemical ingredients or polluting processes. It should contain natural materials with verifiable third-party certifications that ensure their safety for human health and eco-friendly production. Looking for that missing piece of your organic bed? A body pillow can help you align your spine and get the natural, comfortable sleep you need. At Savvy Rest, we offer natural and organic pillows that are customizable to suit the different needs of individual sleepers. Unzip the outer and inner organic cotton casings and remove any amount of fill from our shredded latex, wool, and fluffy kapok pillows, which are intentionally over-stuffed for customization. This allows you to personalize the exact height and firmness that feel best to you. If you prefer a formed pillow, consider a Dunlop or Talalay latex pillow that conforms to your head for soft, supportive comfort. 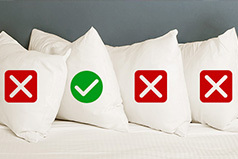 We also carry customizable organic body pillows, a must-have for side sleepers. To learn more about the health benefits of our body pillows, check out this article.